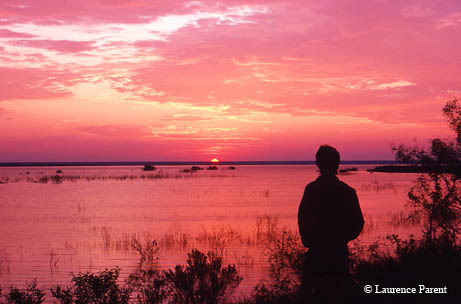 San Angelo offers wildlife-filled hiking and lots of friendly charm. If you haven’t been to San Angelo, go now. There’s so much happening in this West Texas town, you can’t afford to waste one more minute. When my boyfriend/navigator and I finally find the right road, slipping by farms and historic small towns, we aim for our weekend home: The Inn at the Art Center. 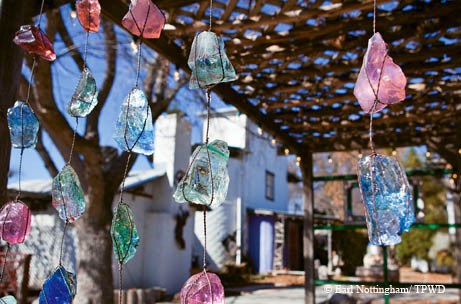 The inn, with three themed bedrooms and an office selling handmade jewelry, is just a part of one of San Angelo’s premier attractions: The Old Chicken Farm Art Center, an eclectic haven for artist studios, galleries and a gourmet restaurant. It used to be a utilitarian, un-eclectic chicken farm that went defunct. But in 1971 Roger Allen, Bill Rich and Richard Ramirez purchased the property as a home for artists — a different look entirely. Now, it is the perfect place in which to get lost — a unique utopia of art and gardens, well-maintained and peaceful. The first Saturday of every month brings music, open studios, artist displays and free activities for the kids. Angelo State Park is only 15 years old, it is home to ancient Permian tracks and Paleo-American petroglyphs (rock engravings). It’s also home to boating, horseback riding, public hunts and the official Texas State Longhorn Herd. Even though the park warned of dry conditions, I’m in a sea of green: mesquite trees, sage grass and cacti surrounding the Burkett trail, winding vines and tall trees cooling the Armadillo Ridge Loop. Lake O.C. Fisher is epic-sized, despite telltale signs of dryness around its perimeter. The wildlife doesn’t seem fazed either. We spot rabbit tracks and paw prints while a baby armadillo feasts in tall grasses nearby. Butterflies flutter around us, rabbits race us to cactus patches, and a biker zips past with a friendly wave. This wave is a gesture of the friendly charm San Angelo offers without hesitation. During dinner at Franco’s Café, our waitress jokes with the ease all residents seem to have. She also tells us where to visit after dinner (even drawing a map). Best of all, she serves us some of the most mouth-watering Tex-Mex we’ve had. If you go (and you should), get something with steak fajita meat — you won’t be disappointed. Best of all, it’s fairly priced. 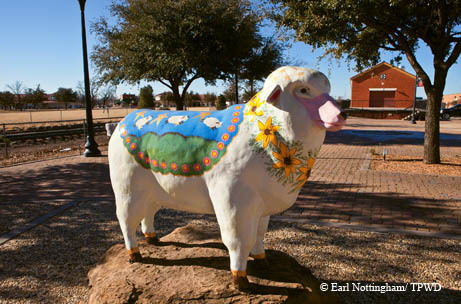 If you like art and history with your downtown, San Angelo says, “You’re welcome.” We see murals, painted trash cans and decorated fiberglass sheep symbolizing San Angelo’s wool trade. Music bursts out of old and restored buildings in a medley of contemporary music and historic styles. We pick the classic rock pouring from the House of FiFi DuBois, “Where the lava lamp is always on.” Specializing in clothes and furniture from the 1950s to the 1970s, FiFi’s is a store by day, a beer and wine bar by night. It’s hard to leave (especially once a group from the local Goodfellow Air Force Base start dancing), but our inn beckons. The next day brings cornflower blue skies and bright sun — perfect weather for Lily Fest, featuring San Angelo’s famous International Waterlily Collection. How does a town in dusty West Texas — notorious for dry spells — have waterlilies? Ken Landon, the director, started working with the flowers when he was 17. He turned the San Angelo Civic Park, once a home for vandals and scandals, into a showcase for “one-half of 1 percent” of one of the world’s largest waterlily collections: his own. His dedication shows in every petal: spiky dark purple, round pale blue and glowing orange floating in dark blue pools. This collection — with about 200 at Lily Fest — features waterlilies from Senegal, Australia and San Angelo, where Landon makes his own internationally renowned hybrids. He casually mentions a floral sunburst that took him seven years to develop. His collection also houses the last native Zanzibar waterlily and a Star of Mexico waterlily, thought extinct until Landon personally tracked it down like the Indiana Jones of waterlilies. “Impressive” doesn’t do his work justice. Yet as we wander, mesmerized, past pools dotted with these exotic blooms, he thanks others for their work and dedication. It’s easy to see that Landon does it all to keep this tableau of timeless beauty alive. Many in his collection are endangered or extinct in the wild, but in San Angelo they have an unlikely home. Afterward, we visit another surprising San Angelo treasure: Miss Hattie’s Bordello Museum. Miss Hattie’s has been popular since its auspicious debut as a hotel and bordello at the turn of the century, functioning above her ex-husband’s pub until the Texas Rangers closed it down in 1946. Ever the resourceful businesswoman, Miss Hattie, whose portrait still presides over the dining room, converted her beloved bordello into a museum. The original 1896 pressed tin ceiling, ornate furniture and photographs of women who called Miss Hattie’s home take you to a time when San Angelo was a boomtown for the oil fields and farmlands of West Texas. And all these oilmen and farmers knew of Miss Hattie — and her secret entrance. The First National Bank and Miss Hattie’s shared a basement wall, and soon influential men were sneaking inside without the front-door fears. “This was the mask,” tour guide Todd Kolls says, until the all-revealing flood of 1938. Now, Miss Hattie’s remains aesthetically unchanged, though her clientele is limited to intrigued tourists and bachelorette parties. By the light of ornate oil lamps, we instantly notice that the ladies’ rooms have only screen doors. “Men tended to behave better when they were on display,” Kolls explains. Each room is dedicated to a lady’s legacy. Miss Rosie wore only red and started a trend: “It became known if you’re down on Concho Street in red high heels, you worked for Hattie.” Her 1919 San Angelo High School diploma is still in her room. Miss Goldie was famous throughout Texas for her blond tresses and high prices. Although charging $2 an hour — “four or five days’ wages then” — she quit for a man’s love, only to return when her happy ending failed. The next day, after lunch at the elegant and delectable Fuentes Café and a visit to the famous river walk, we find Fort Concho, San Angelo’s roots. Named after the Concho River flowing nearby, it officially began Dec. 4, 1867, as a defense against Native American attacks and as a trading post. A community flourished around it, and soon prominent landowner Bartholomew J. DeWitt started San Angela, named after his wife. The United States Postal Service urged that the name be changed to San Angelo, and the town transformed from a vice-ridden village to an oil boomtown to a busy city of more than 100,000. The once-bustling and diverse military community of Fort Concho is almost hauntingly quiet, but much is preserved as if soldiers, chaplains and laundresses will return momentarily. Around 400 people could and did live at Fort Concho at once, including all four Buffalo Soldiers regiments, in 40 buildings made from native limestone. Square and utilitarian outside, they set the scene for a turning point in the Indian wars and Texas history. Many buildings house a variety of period weapons, medical tools and uniforms, among other artifacts. Their lives weren’t easy (a point the post hospital illustrates with iron lungs and leg saws), but the fort was instrumental in mapping, securing and shaping Texas. Although the last soldier marched away in 1889, their presence persists in a fort too vital and a town too alive to be afraid of time. In a region proudly Spartan, they were and are still strongholds of commerce and culture, held together by the biggest sky in Texas.